Sunday night we went to the parkette to the west of the flatiron building near St. Lawrence Market. 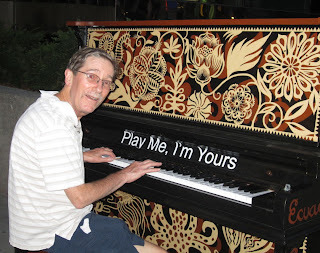 There we came across a lovely pianist, who was very welcoming. 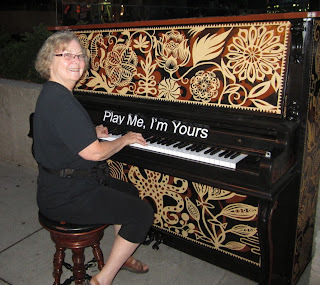 She introduced herself to her "come by chance" audience; sat for pictures or videos and happily explained how, although she had studied music, she just made up pieces as she went along. Such as this one.. I am in awe of people with such tremendous talent!! On Monday, another talented person, Fiona Ellis - knitter extraordinaire, sent me a note to say that there was a street piano at the Roy Thompson Hall. I couldn't resist!!! My husband kindly agreed to drive me downtown to see what was "happening" in Ecuador. That's the country represented by this piano. No one was around to play, so my husband and I "faked" it. It was such a beautiful piano on a lovely warm night in Toronto that you could believe for a few fleeting moments that you were somewhere exotic - maybe Ecuador - and that you too could make music. Anyway about a block or two away there was another street piano in front of the CBC building that houses the Glenn Gould Theatre. We hurried along because there was a group there, who unfortunately left just as we arrived - well not to worry because another group - two young men, walked by. The first said that he didn't play and the second said that he didn't read music but could play by ear - this is what we heard. I thanked him for the video and he thanked me for listening to him play!! Just an awesome evening!!! The first piano was from Peru and the last Barbados. Glenn would be happy!! !